Lemon Blueberry Cheesecake in a hand held bar topped with crumbs. This is light and refreshing with hints of lemon and bursts of blueberries. Not bad considering about 5 minutes before I started putting this together I couldn’t decide what to make. We had a staff party last Thursday for the summer camp we volunteer at and I was asked to bring a dessert. I did have both Two Bite Chocolate Chip Cheese Danishes and Buttery Walnut Toffee in my fridge but I didn’t feel like sharing. My husband isn’t a big chocolate guy but he loves cheesecake. And I had the ingredients to make cheesecake but wanted something a bit lighter. I love cheesecake too but it can be heavy after a big meal and I knew our hosts were making a big spread. 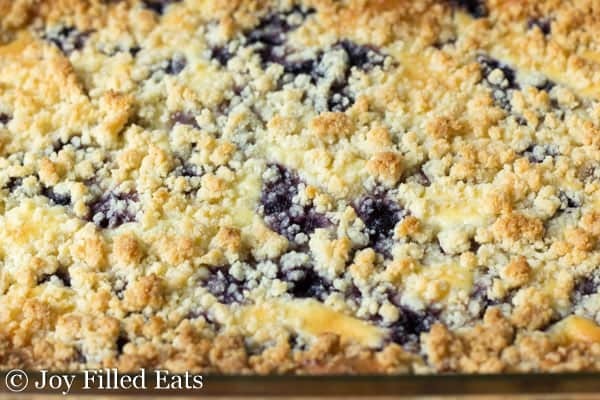 Lemon Blueberry Cheesecake Crumb Bars. Low carb, sugar free, grain free, THM S.
The ingredient list isn’t nearly as long as it seems. Every part has repeats. This only has 10 ingredients! Put crust ingredients in a food processor. Pulse until crumbs form. Dumb into a 9 x 13 baking dish. Press out into a thin bottom crust. Bake for 10 minutes. Next, put the crumb topping ingredients in the food processor. Pulse until crumbs form. Dump into a spare bowl and set aside. Meanwhile, put the cream cheese in the food processor (no need to wash the bowl). Process until smooth. Next, add the sweetener and pulse until well combined. Add the other ingredients and pulse until smooth. Remove the crust from the oven. Pour on the cream cheese filling. Sprinkle on the blueberries. Scatter on the crumb topping. Bake for 55-65 minutes until the center only jiggles slightly. You may need to cover the top with foil for the last twenty minutes so the crumbs don’t burn. 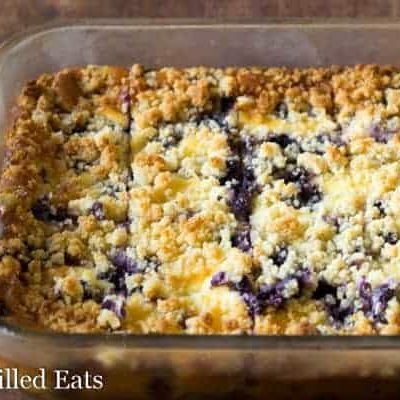 These Lemon Blueberry Cheesecake Crumb Bars are the perfect combination of cheesecake and crumb cake. 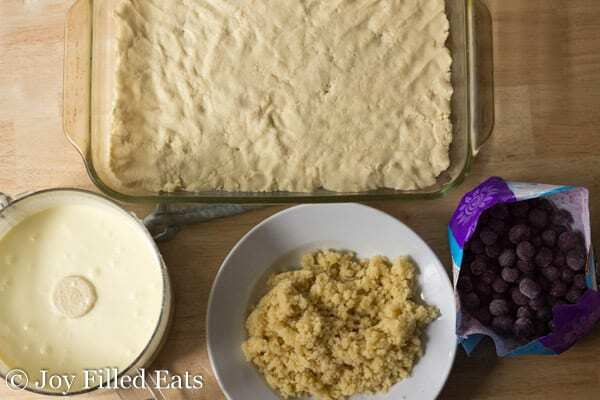 They have a crisp crust topped with cheesecake, blueberries, and sweet golden crumbs. Bake for 55-65 minutes until the center only jiggles slightly. You may need to cover the top with foil for the last twenty minutes so the crumbs don't burn. Made today with great result. Looks exactly like photo. Only variation is used fresh berries. Do not skip topping step! I was wondering how much THM baking blend I could substitute for the whole recipe? A little less than the amount called for. Crumb toppings are better with almond flour but baking blend should work. These were really good the first time I made them, so am making them again. Wondering, however, what it the purpose of the 1-1/2 teaspoons of coconut flour? That is such a small amount, but it must be there for a purpose. Could you help my inquisitiveness, please? I feel so dumb! Should the better for the crust be melted? Or cup in pieces? Cut into pieces. It's such a small amount that you can even through in the whole chunk at once and the food processor will do it's job. Something went wrong with my crust. It turned out like sand. I followed the directions exactly though. Weird. No one else had this problem. Everything else was amazing though. I’ll make these again, if I can figure out how I botched up the crust. Are you sure you only used 1.5 teaspoons of coconut flour? Using too much coconut flour can throw it off. Or you may have needed to process it longer. The dough comes together after a few minutes in the food processor. I have made these at least 4 times. They are wonderful!! The only thing I did was made an extras batch of the crust because I liked mine thicker. We absolutely love these and so do others when I take them somewhere! How many extra batches did you make? I like mine thicker too, so figured be a good idea to ask. Also did you follow all the recipe as posted? I read some of the comments below and wonder if the recipe had been edited. You know to troubleshoot. Thank You. 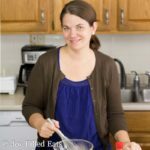 My son has a possible food allergy to coconut and I was wondering what I could use as a substitute for the coconut flour. Thank you! You should be able to use additional almond flour. These are absolutely, amazingly, delicious!!!!!!! Thank you so much for this recipe. I handed it over to my 13 year old daughter and she whipped it up with no problem! I would suggest an edit to your instructions. In your instructions you say to add the rest of the cheesecake filling ingredients to the food processor and blend until combined. I did this and then saw that the blueberries were not part of that. Partially my fault for not reading ahead. Because of this ours did not turn out tasting like cheesecake AT ALL! The middle is grainy and doesn't taste good at all :( I will try it again next time I show and get fruit. I am very sorry about that. I will definitely edit the instructions to make that clearer. I'm sorry they didn't work for you Amy. I'm going to make this recipe soon to troubleshoot. It's been awhile since I've made it. I was wondering, is agave nectar okay to use as the sweetener? I like to use that and all the other sweetness everyone is asking about, I've never heard of. Also, will that still be qualified as sugar free and healthy if I use agave? Stupid question, but do you thaw the blueberries before you use them? Can I use all coconut flour instead of coconut flour and almond flour. Can't seem to find any almond flour. No. Coconut flour is much drier. You could always buy whole almonds and grind them to almond meal for this recipe. That would work in place of the almond flour. Would I be able to feeeae the bars? I had mine sitting on the counter all day I didn't know I had to refrigerate it. Should I throw it out? I wouldn't. I'd just put what's left in the fridge. Yes, I refrigerate most THM and low carb baked goods but since this has a cheesecake layer it definitely needs to be. That is good to know and would be helpful To include in the instructions. Will this freeze well in individual servings? I think so. In general, cheesecake freezes very well. I don't have any of the sweetner. Do you think I could use truvia? Would I keep the amount the same? Thank you! Are fresh blueberries ok to use? Wow this is so delicious!! Just what I needed. 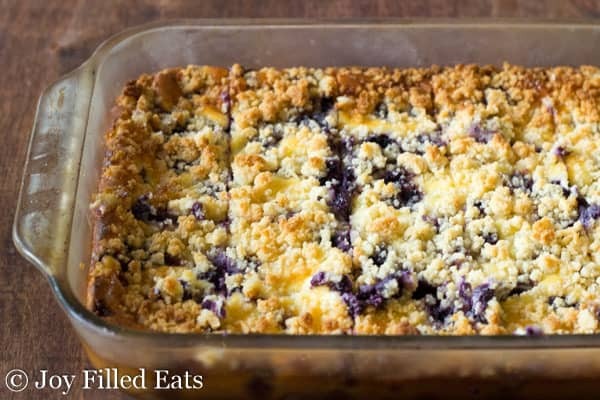 So refreshing with the lemon and so comforting with the blueberry and crumb mixture. Love it!! This may be a silly question, but do the leftovers need to be kept refrigerated? I just put this in the oven and then realized I forgot to add the eggs to the cream cheese center.... wondered why mine was so hard to smooth! can't "undo" the put together pan add eggs and reassemble so I figured I would just bake it for a little less longer since the eggs don't have to cook and see what happens... hopefully a happy accident! Thus looks delicious! I have thm baking blend but no almond flour. Do you have a suggested substitute amount? Thank you!!! Use a little bit less. The baking blend absorbs more liquid. I used pyure for my sweetener and it came out way too sweet. I'm new to using the stevia blends but because the gentle sweet has the same two types of sugar I went ahead with it. I'm not sure how to adjust these when using different brands. I find Pyure to be twice the sweetness. I always use half if required. This is too, too sweet for my husband & me. Wondering how we can "fix" it. Don't want to throw out this entire 9x13 pan of food. Any suggestions? I was thinking about putting a big scoop of plain yogurt on top of a serving. Sure. You're the first person who has said it is too sweet. Did you use gentle sweet? Can you sub with raspberries? If I don't have coconut flour and not quite enough almond flour, can I sub a baking blend mix similar to THM's? What happens if I omit the sweetener? I dont have the ingredients for that blend and id like to make these asap! Is it 1 1/2 tsp coconut flour or 1 1/2 cups? Will this work with fresh blueberries? Do you eat this warm or cold? I don't have a food processor. Would it work to use my blender? Maybe. I have an older cheap blender and I don't think it would work in mine. I think so but I'd bake the cheesecake for ten to fifteen minutes before adding the crumb topping. These were good. Next time I will leave the crumb topping off, as it got soggy. It did not prevent me from eating the whole pan though! Glad you liked them. You could add the crumb topping after they bake for fifteen min or so. The cheese filling should be set enough that they stay on top. Mine weren't soggy so I'm not sure what happened. This looks delicious! I love blueberry anything. Definitely a great idea to make a lighter version of cheesecake. 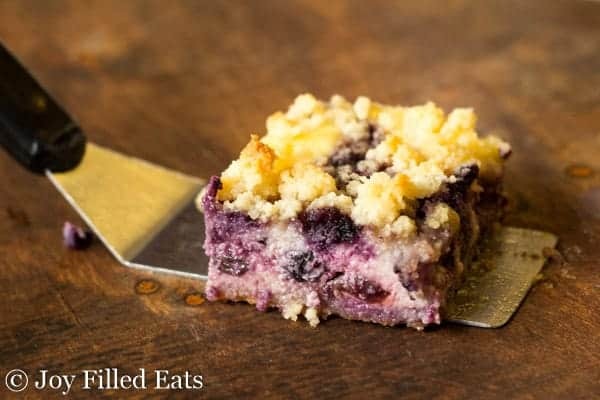 My husband loves cheesecake and although I have made him blueberry bars, I have not made them with a crumb topping. He will LOVE these. Thanks! These look So good! lemon and blueberry is a favorite flavor combo for me! This looks amazing! You can never go wrong with cheesecake! Would this work with frozen raspberries? Yup! If you try send me a pic :) I'd love to share it on my facebook page.